The following tutorial is about Page Object Model and Page Factory, a design pattern intended to simplify tests and create a scalable solution for test automation. If you want to develop maintainable and reusable tests, prevent unwanted code duplication and make your testing life much simpler – Page Object Model is definitely one of the best ways to go! 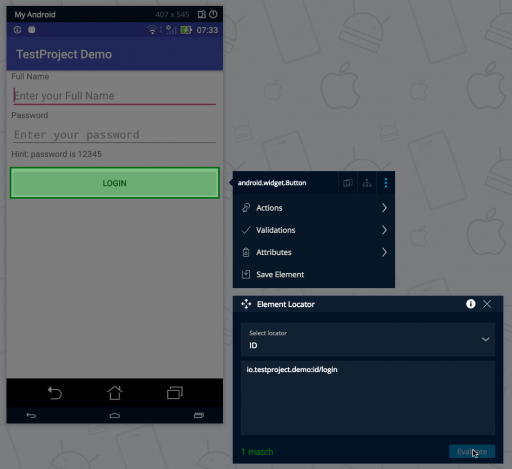 This test example below automates the TestProject Demo app. You can download its APK or view the complete source code. To start the automation, the Test prepares Android driver capabilities with all the required information about the device under test (DUT) and App under test (AUT). Then, using these capabilities, it initiates the Android driver that will be used to invoke various Appium actions on the mobile application. To perform the actions, Appium must identify the elements it interacts with. To do so, it uses various location strategies. The most convenient location strategy is the ID (aka. 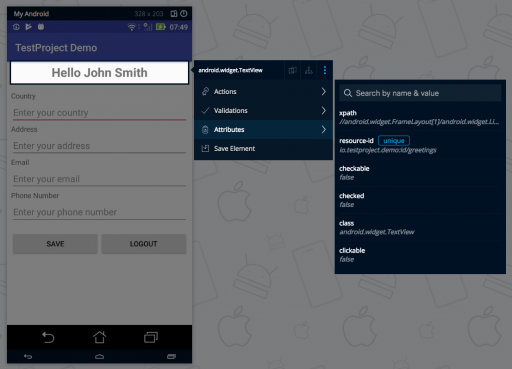 resource-id in Android). For example, it searches for the login button to make sure that the login screen is displayed using By.id and the value login. I will show how to identify your element locators later in this tutorial, here. So, it’s time that we learn how to build an Appium test utilizing Page Object Model and Page Factory. First, let’s define our page classes. In the demo application we tested, we have two pages: Login page and Profile page. To map the elements, POM uses the FindBy annotations. These annotations should be used to decorate the fields declared for the elements. Location strategies can be different, but the most convenient one is the ID (aka. resource-id in Android). To find out what are the right values to use, we used TestProject inspector and element locator. *No worries, TestProject is FREE to use forever. 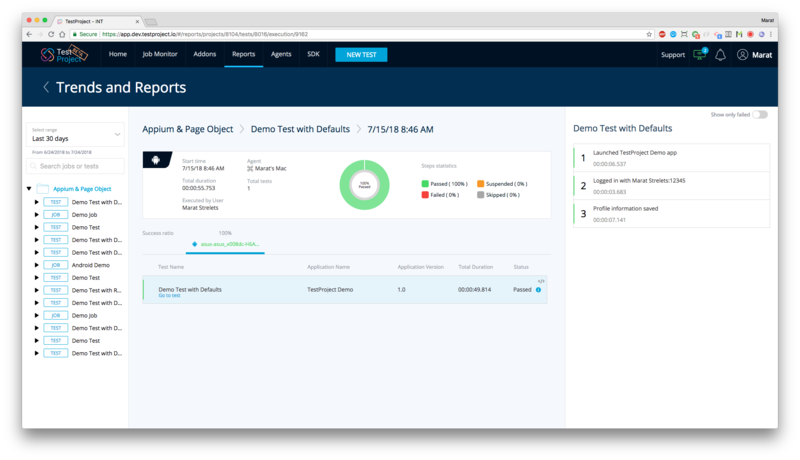 All you need to do in order to use the TestProject element locator is to install and register the TestProject agent (Here‘s a quick video showing just how you can do it). Then, just click on the page and select your element. With the TestProject element locator, you can copy the XPath, CSS Path, Tag name or Id (if available) of any element on the page. Obtained values were placed in the annotations in the code. Then, initElements method residing on the PageObject factory class should be invoked to initialize all the elements of the page. Elements, page class fields, are now being used across the page to manipulate the UI and encapsulated in methods invoked externally. Let’s locate the elements for the profile page class on the same manner we did for the login page above. This test is identical to the one above with the only difference that all the UI actions are now encapsulated into the pages classes. Instead of searching and manipulating elements directly, this is being done using convenience methods (e.g. isDisplayed) implemented by every page. By now we’ve built a test with Appium and POM. You don’t need to setup Appium/make any configurations. You don’t need to worry about setting up your entire automation framework. 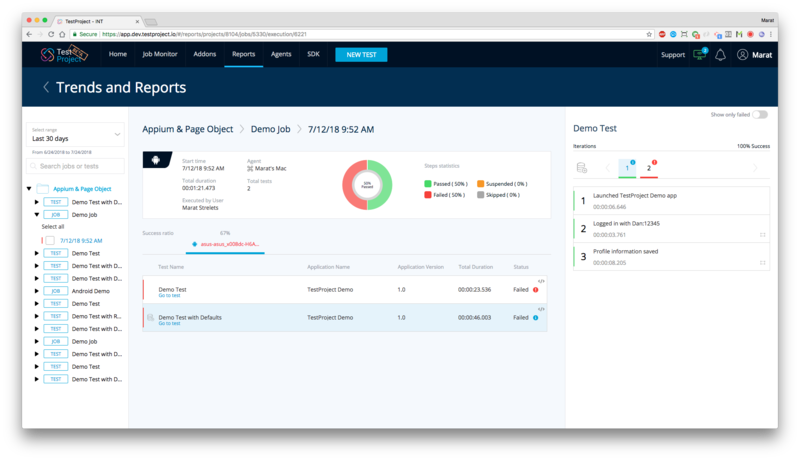 You get a beautiful dashboard with test automation reports including screenshots. Once the tests are uploaded to TestProject, you can schedule to run your test anywhere across your account. No special proxy configuration is required, everything is running locally across your organization. You get tools such as element locators and recorders out of the box as part of the TestProject agent installation. 98% of TestProject users use the free forever plan. The pages classes remain the same. Test class is annotated with @Test annotation providing the test with a friendlier name. Input fields declarations annotated with @TestParameter allowing the test to be parameterized when executed and supplying default values. Calls to report.step allowing to report test milestones providing better progress granulation by reviewing them in the results and reporting dashboard. Call to report.result allowing to provide final statement for the test execution before it passes or fails. Here you can find more documentation for TestProject SDK: https://github.com/testproject-io/java-sdk-examples. What is your opinion? Have you experienced Appium with Page Object Model? Where is the POM.xml of the given tests u wrote ? Yes POM.xml will be very helpful as appium & selenium versions really matter.